This collection consists of records related to the Arctic Council, the Arctic Policy group, and the Arctic Environmental Protection Strategy. The Arctic Council was established on September 19, 1996 with the signing of the Declaration on the Establishment of the Arctic Council, more commonly known as the Ottawa Declaration between: Canada, the Kingdom of Denmark, Finland, Iceland, Norway, the Russian Federation, Sweden, and the United States of America. The Arctic Council was created to promote cooperation, coordination, and interaction between the arctic states. 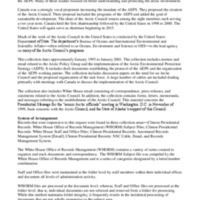 This collection dates approximately January 1993 to January 2001 and includes memos, speech drafts, discussion papers, and email.